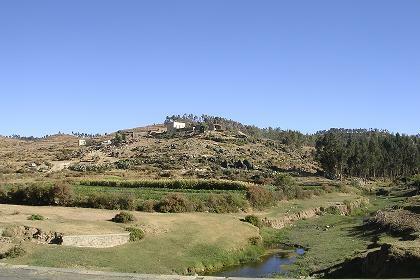 The hike from Nefasit to Asmara, last Wednesday was a pleasant experience (given the climatic conditions). A fantastic exercise for my more than 50 years old body, and an alternative way to mix up with Eritrean people and nature. 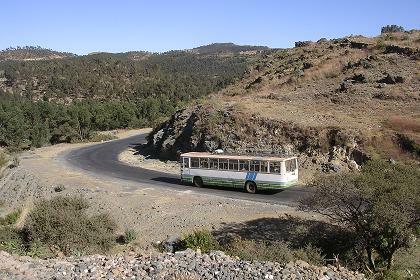 Returning from Keren, I noticed that there is a regular bus connecting Serejeka and Asmara, and one connecting Asmara and Emba Derho. 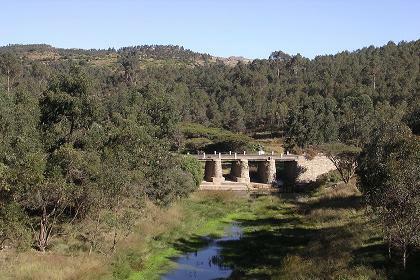 Today's walk will be Emba Derho - Serejeka, just over 10 kilometers, and offering a nice view on agricultural activity and Eritrean landscape. An early bus number 18 takes me from the bus terminal on Eritrea Square to Emba Derho. With a firm breeze in the back on a smooth asphalt road, the march is a piece of cake, passing a few scenic views on wonderful agricultural landscapes, the majestic view of the mountainous terrain of the highlands, the small rivers and immense water reservoirs. 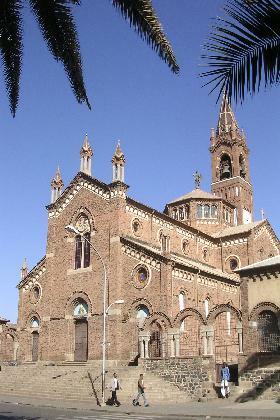 Greeting people with "Selam" (peace), the usual answer is "Merhaba" (welcome). Farmers harvesting, threshing the harvest with the help of their cattle, and small scale transports of the products to the market. People ask me where I'm going. I point in the direction of Keren. One time I use the word "Keren". The man is in panic and tries to explain it is 80 kilometers to Keren, gesticulating with eight fingers. I know, but I do not know the Tigrinya equivalent of "Just joking!" 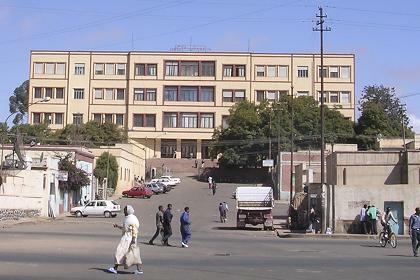 Just before noon I arrive in Serejeka, to join a group of people waiting for the bus to Asmara, that will leave at 12:00. Back in Asmara, I start finishing my two weeks tour, visiting family and organisations that assisted me to have a nice time (special thanks to Tedros of Travel House who substantially contributed to my itinerary for these two weeks). I enjoy the pleasures of Asmara: sitting on a pavement, drinking a fruit juice, watching the people or walking through the center using the CARP map of Asmara as a guide to visit places of architectural and cultural interest. I share my budget with those less fortunate, glad to buy them a sandwich, or a drink. Share a table with Eritrean men to drink a beer, and give generously to a woman sitting on the sidewalk, hiding a baby under her dress, happy to give up my luxury for her survival (special thanks to Hendrik Thomann and Dawit Telahun of the Asmara Brewery). 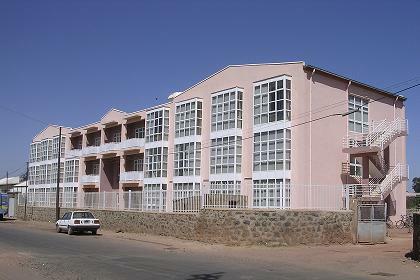 Traditional house 'Hidmo' - Emba Derho Eritrea. 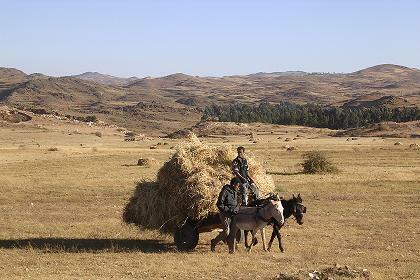 Harvesting - Road to Keren Eritrea. 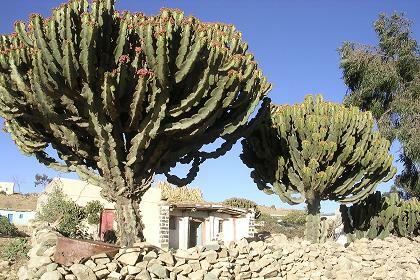 Scenic view - road to Keren Eritrea. 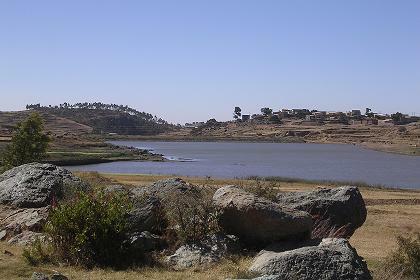 Water reservoir - Serejeka Eritrea. 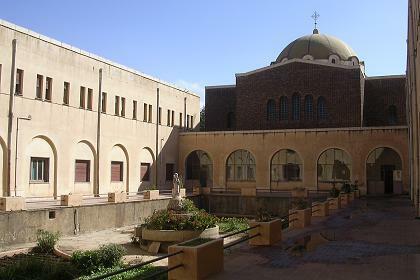 Theological School - Mariam GMBI Street Asmara Eritrea.